A friend of mine recently asked if I’d like to contribute baby bibs to a fundraiser she was hosting for a charity in Africa. 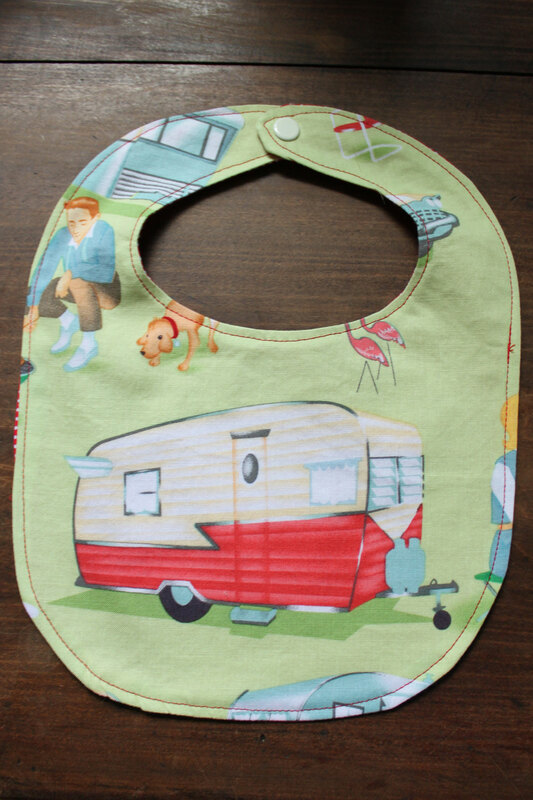 I was glad to, especially since bibs are easy to do assembly-line style and I could use the opportunity to get all the baby bibs done I had in mind for my new one at the same time. 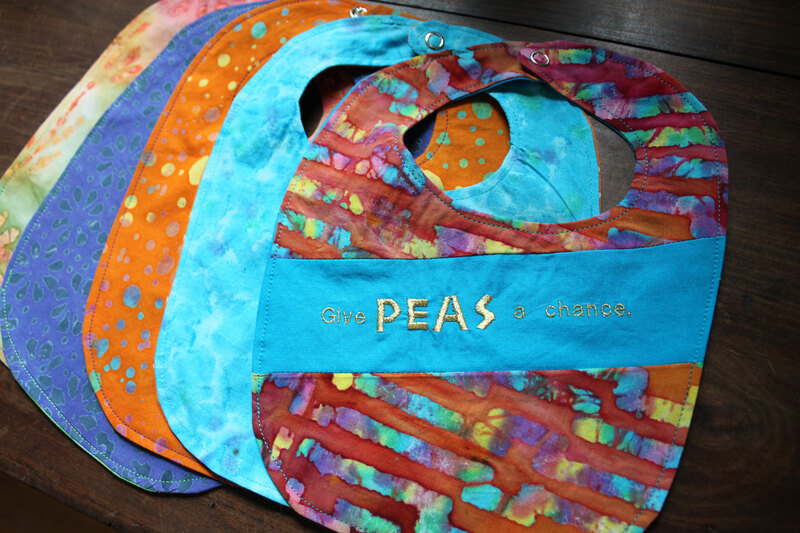 I chose some global-looking batiks (all are reversible) for her fundraiser bibs and embroidered the cheeky message “Give peas a chance” on the top one. I hope they sell well! 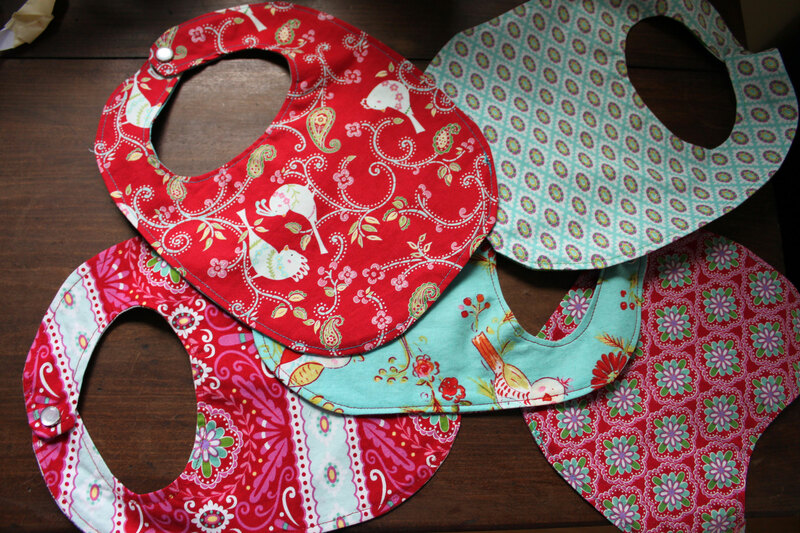 For my own girl, I made a set of five bibs in the bright little birdie fabrics I have used for her crib bedding and quilt, then I made five more in novelty prints (ok, mostly travel trailers!) to round out her collection. 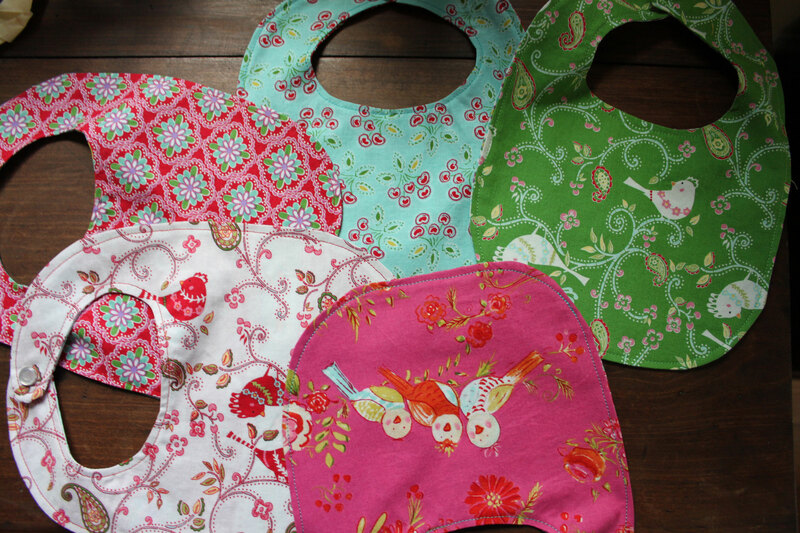 These are all just basic cotton bibs that fasten at the top with snaps. 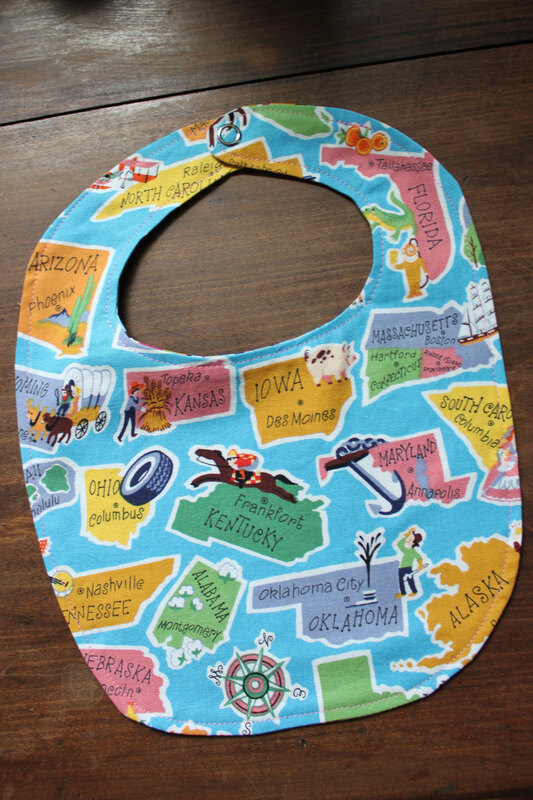 I don’t remember exactly where I got the pattern, but you could cut around your own favorite baby bibs just as easily as using a pattern. The only trick to them is to clip the seam inside in plenty of places so it presses out smooth around all the curves. 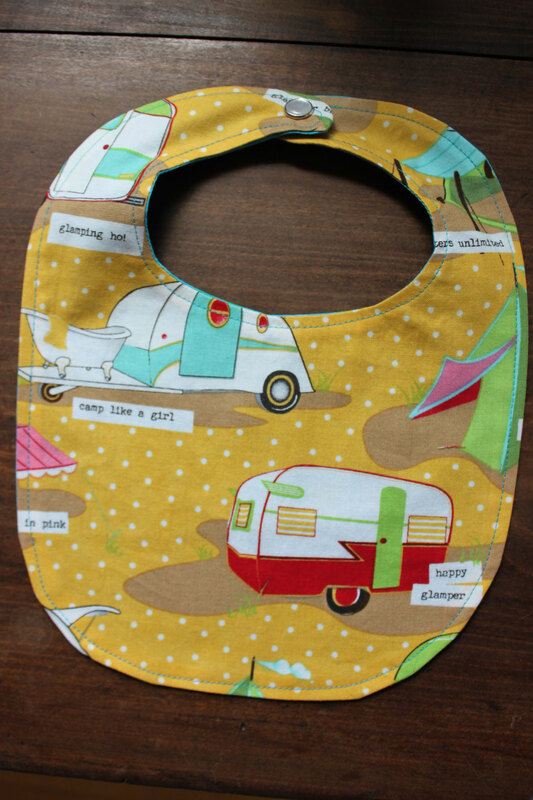 These are all similar to the bibs I made for Worth a few years back, but are cut a tad longer to catch more spills. 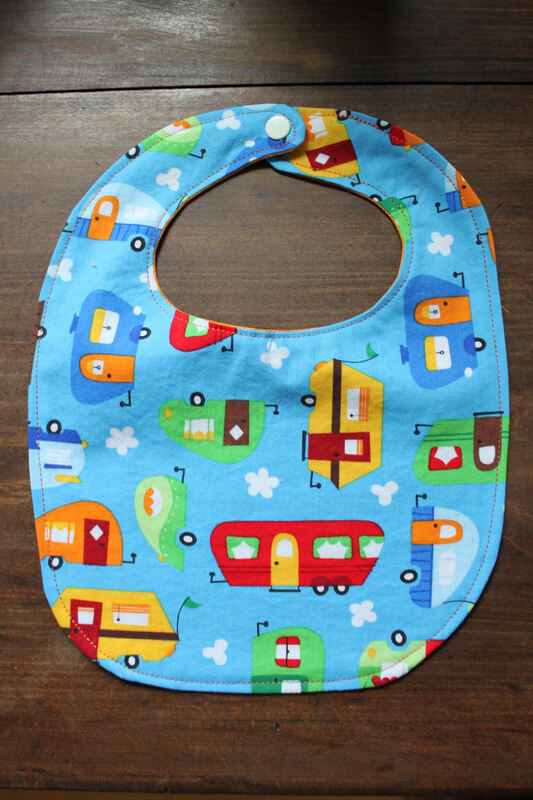 These are so much softer than plastic bibs, and they hold up well to normal messes. If they get super gross I just give them a quick rinse and hang them to dry over our kitchen laundry bin before tossing them in. Otherwise I just add them in with our rags and towels as-is. They also fold up small so it’s easy to keep one in my purse once the baby’s big enough to be eating meals out and about. I won’t use any of these until she starts solid foods, but I’m glad to have them done and ready now. 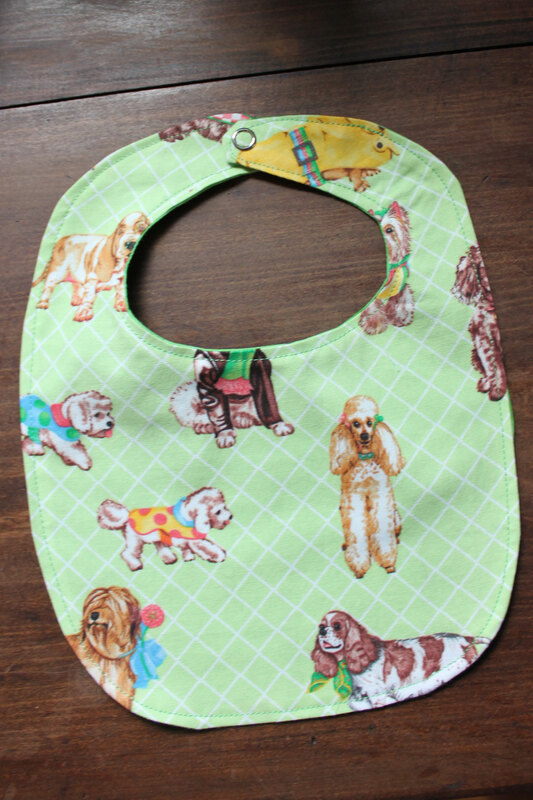 I make bibs too, and I love these. Is that cute phrase patented?? I’d love to use it on the next bib I make (I make them for our missionary wives when they give birth). For me, I still prefer the plastic ones because it is much easier to clean. Although the bibs that you have created is quite awesome, I love the designs.